Turkish Boza is a smoothie like fermented drink that is mainly based on bulgur and yeast. It has a sweet and tangy flavor that everyone finds addictive! Turkish Boza is a fermented drink, so you need to have enough time to make and wait it. It is made from bulgur, rice, sugar, yeast and water. 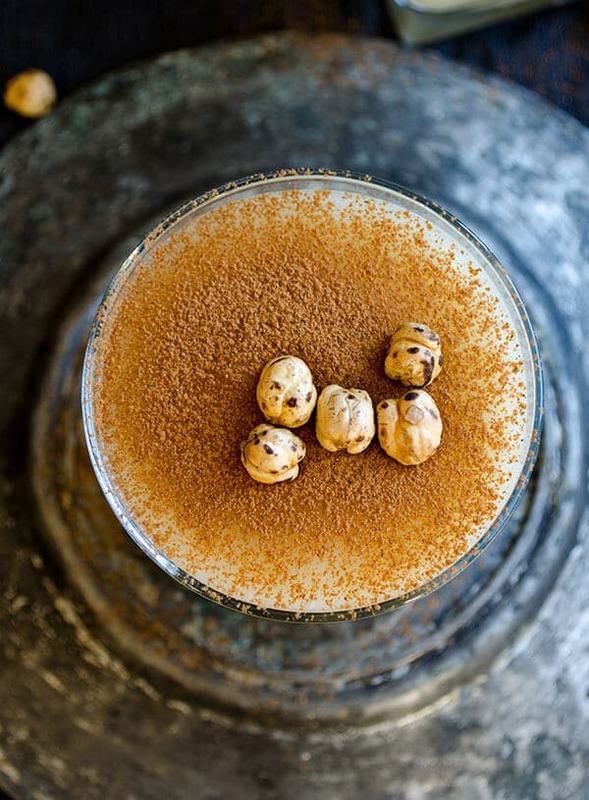 As it is a drink people in Turkey have in fall and winter, I wanted to update this post with some new photos (see them below) so that you can notice this amazing drink and hopefully try it yourself. Believe me you’re missing a lot if you haven’t tasted it yet. Don’t get surprised when you hear the voice of a street vendor selling boza in cold evenings in Turkey. I feel like I’m in a time machine travelling to old days, to Ottoman Empire times whenever I hear his voice on our street. It was known as a great drink to warm and strengthen your body, so it was one of the ultimate foods for the Ottoman army. You don’t feel cold and you get stronger as you drink Turkish boza! What’s more, it is suggested to new moms since it increases breastmilk quite lot. It is a malt drink made from bulgur and it’s so rich in carbs. It’s almost as thick as a pudding with a sweet and tart flavor. You might find it weird when you first try it, but then you easily become addicted before you realize! You don’t need many ingredients to make Turkish boza. Plus, I think you won’t have any difficulty in finding the ingredients although it is a traditional recipe. Turkish Boza is one of those very traditional drinks and it’s typically sold in winter although it’s not a hot drink. It’s associated with cold days and snow because it has a warming effect, but I think it would be a great summer drink too since it’s served cold. There are some very famous boza producers in Turkey and the most famous one is Vefa around the country. Although it’s not as famous, there is a local shop in Eskisehir called Karakedi Bozacisi and I find their boza even better! You should see how that tiny shop gets full in winter. There are no chairs or tables in this shop, people just stop by and grab one of glasses filled with this amazing pudding like drink on the counter. They don’t even need to give order, vendors prepare the glasses beforehand so that the customers can easily take one and enjoy their drink standing. 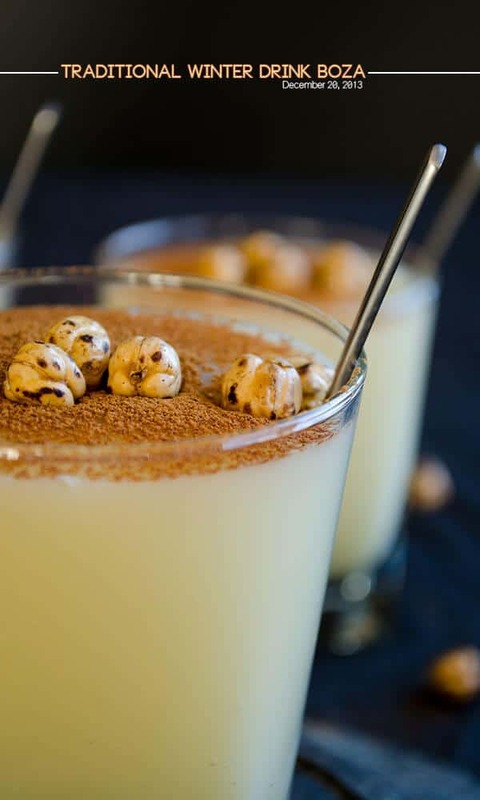 Turkish Boza is traditionally served in typical Turkish water glasses with cinnamon and roasted chickpeas on the top. A dessert spoon is just dipped into it and you can either drink it or eat it or do both depending on your craving. Not something traditional, but I love to garnish my boza with mint sprigs or sometimes with fruit like pomegranate or persimmon. 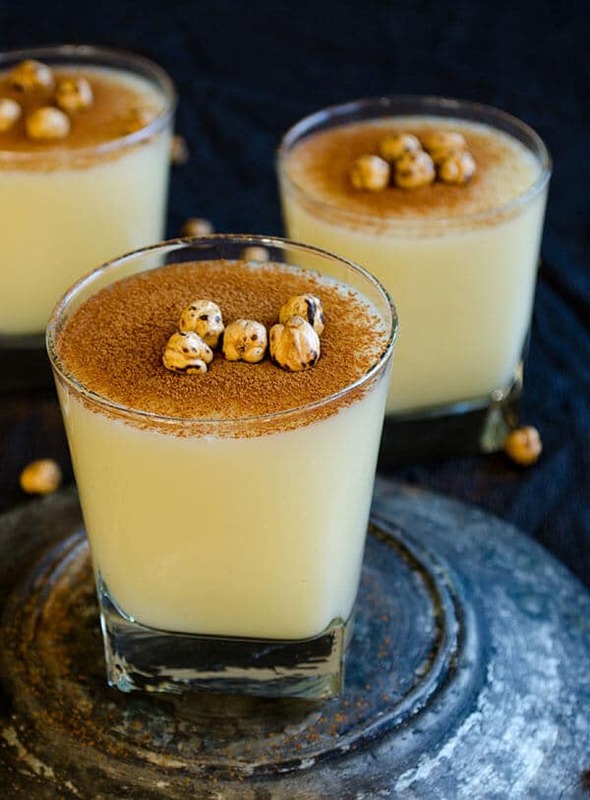 We don’t prefer making boza at home since we have a great producer in our town and it’s even sold at most of the supermarkets in Turkey, but I’m going to share the recipe of it for those who are away from Turkey and don’t have chance to buy it prepared. 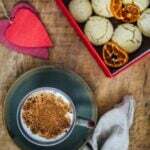 Love Turkish food and drink and want to learn more? Check out our Turkish category in the recipe index above. A suggestion: Start by learning How To Make Turkish Coffee, especially if you are a coffee lover. A perfect smoothie-like Turkish drink made from bulgur and rice. Fill a large and deep pot with 14 cups water. Wash bulgur and rice very well, add them into the post and boil until mushy. Strain them using a fine strainer and pressing with a spatula. Throw the dregs away. Let it sit uncovered away from the sun for about 2 hours. Mix 1 tablespoon sugar and yeast with 1 cup water and add into the pot. Cover it with the lid. Let it sit in a cool place for about 20 hours stirring every once in a while. Add the rest of the sugar after 20 hours and stir well. It used to be famous in Romania, where it’s called Braga. In eastern parts it’s made with wheat and maize. Never heard about this before. Great to discover that we have foods in common. Ok, so I think I need some more explanations. What are dregs? What exactly an i keeping? The water that I cooked in? And how mushy does it have to become? How long exactly do I cook it? I have the same ? Alex does!!!! Why extra sugar and not normal sugar? Merhaba Zerrin bozanin arpayla yapildigini biliyorum. Bulgurla yapildigini ilk defa duydum. I have to give it a try. Beautiful pics. I’ve never had boza in Turkey, but I’ve had it a LOT in Bulgaria. So glad I found a recipe, thanks much. And your pictures are really great! Thank you! I didn’t know they have boza in Bulgaria too. Not surprising though as we have lots of foods in common. Would love to hear the result when you have a chance to try the recipe. How long does Boza keep once you have made it? You can keep it in the refrigerator for 3-4 days. Thanks Zerrin, tried first time and came out great. I would like to use this boza for the next batch, so i have frozen it. Do you know how much we should use from the old boza instead of instant yeast for the same amount of ingredients? Great to hear that you loved it! About 1/4 cup boza should be enough for this amount of ingredients. Perfect looking shoots! An interesting list of ingredients considering that it is a drink, I have never had anything similar before. Merhaba Sacide hanım, en kısa zamanda yorum olarak burada paylaşacağım. Ececim, can’t wait to see you and your zuzus in my city. Will be waiting for your call. Can’t wait to try this. I am going to use millet flour, and was wondering if I could use grape yeast rather than bread yeast? I don’t have access to boza but would like to try from scratch, if possible. Thank you! Hi Whitney! Never used grape yeast before, so I’m not sure. Would love to hear your result if you try. Maybe it helps other readers too. i used grape yeast, and it actually worked well! it was actually very relaxing to drink. i just discovered, however, that it become sour very quickly…after 3 days, it was perfect, even 4. but today about day 6, it is very sour. if i use the leftover as a starter for my next batch, will it be good as sour as it is, or should i add sugar, or start completely over with the grape yeast again? thanks so much! Thank you for sharing your result here. And I’m very happy that you are satisfied with the result. Well, this is another question I’m not sure about. I guess the boza becomes sour if you use a sour starter. I’d recommend you to use the grape yeast again and wait it less this time so that it doesn’t get sour. Thank you so much for your recipe! 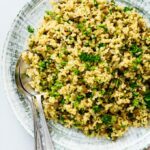 I have a little question about the recipe: After I cooked the bulgar and the rice, all, or most of the water was absorbed. – Not much to strain … Did I cook it too much? Should I add water or it ruined and should I start again? Maybe you can tell me what it consistency is supposed to be at this point? Is it like a pudding as you describe the final version? Hi, Zerrin. Thank you so much for posting this recipe. I had been to Turkey many times and somehow had missed out on boza. This last visit I had a chance to stop by Vefa and enjoyed this divine drink for the first time! So just one question about the recipe though, many other recipes seem to call for three or four days fermentation. With this recipe is it good to drink after the 20 hours you mentioned? Hi Brian, Vefa is the best boza brand you can find at the market. It’s an addictive treat, isn’t it? Just check if it’s done after this time, you can understand it easily as you already know how it tastes. If you think it needs more time, wait it for some extra hours. I must warn you though, if the temperature is very hot, this duration could even get shorter as the heat helps fermentation. Keep it in the refrigerator afterwards. Otherwise the fermentation continues and you’ll end up with an undesired taste and smell. What a nice comment! Thank you for your kind words. It’s my pleasure to be discovered by a novel reader. Feeling honored 🙂 Haven’t read that novel yet. It’s in my list now, thank you for your recommendation. Hope you have a chance of trying boza in Turkey one day. Instead of yerst Can i juse a cup of Boza ? Yes you can, in fact It is much better to use an established Culture. The yeast (maya) you get from the store is not the same as the Maya for boza. The store bought yeast produces alcohol, but the tart acid flavor is produced by bacteria that consume the alcohol. This is, similar to making vinegar or sourdough “maya”. Keep a little boza from each batch like you would yogurt and add it to your next batch. Thank you so much Bob for this detailed information!